Aneurysms may burst and bleed into the brain, causing serious complications including hemorrhagic stroke, permanent nerve damage or death. Once it has burst, the aneurysm may burst again and rebleed into the brain, and additional aneurysms can also occur. 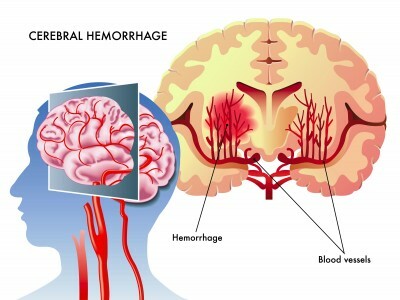 A delayed but serious complication of a hemorrhagic stroke is hydrocephalus, an excessive accumulation of cerebrospinal fluid in the brain which causes the ventricles to widen, putting harmful pressure on the brain. Another delayed post-rupture complication is vasospasm, in which other blood vessels in the brain contract and limit blood flow to vital areas of the brain. This reduced blood flow can cause stroke or tissue damage. Once blood enters the brain and the surrounding space, there is direct damage to the brain tissue and functions. The amount of damage is proportional to the amount of blood leaked. This damage is caused by increased pressure and swelling from bleeding directly into the brain tissue, or from local cellular damage to brain tissue from the irritation of blood in the space between the brain and the skull. Once an aneurysm bleeds, there is a 30-40% chance of death, and a 20-25% chance of moderate to severe brain damage, even if the aneurysm is treated.